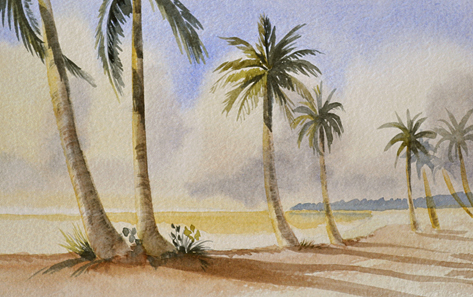 I just finished this palm tree watercolor painting of a row of palms along the shore. My goal was to use a little different variety of colors to achieve a soft golden light. I often see these puffy low clouds along the horizon here in south Florida. So instead of a bright midday light I decided to use a late afternoon warm light. As you can see in this palm tree watercolor painting the light is coming from the left side of the painting. I used raw sienna for that glow and by the way raw sienna is one of my favorite watercolors and I use it often when I am painting with watercolor. My favorite brand of watercolor is Winsor & Newton, I have been using it for years so I am comfortable with the colors. The blue in the upper sky is french ultramarine with the cloud shadows a mix of the french ultramarine blue and light red. The water and shore is raw sienna and light red along with the tree trunks of the palm trees. The distant land is a mix of the ultramarine with a small amount of light red. The green of the palm fronds is raw sienna, paynes grey and french ultramarine. Overall I am pleased with the outcome of this palm tree watercolor painting. The size of the painting is 7″ x 4.5″ and I will put a white mat around it for an overall size of 8″ x 10″. That frame size is common so it is easy to find a nice ready made frame that will complement this palm tree watercolor painting. Florida Ocean Beach Bicycle Painting On Sale!